IF THERE were any lingering doubts about Afghanistan's stature as one of the most mercurial sides in limited-overs cricket, Rashid Khan and Mohammad Shahzad dismissed them in style during an epic Asia Cup tie with India. Having secured their place in the tournament final, India admittedly fielded a weakened side for the dead rubber in Dubai, resting skipper Rohit Sharma, plus bowlers Bhuvneshwar Kumar, Jasprit Bumrah and Yuzvendra Chahal. 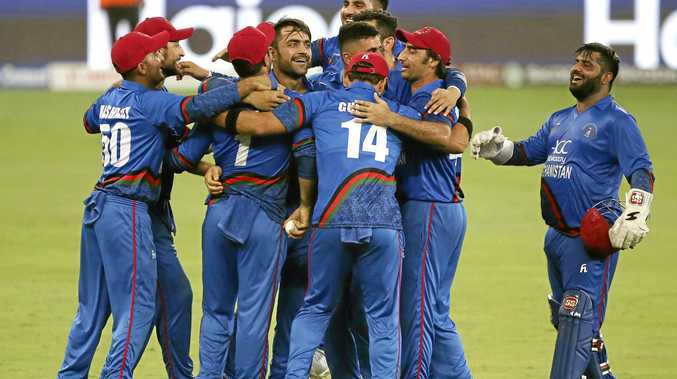 Afghanistan were already eliminated from the competition but determined to make a statement against their neighbours, who have helped develop the game in the strife-torn nation - even offering two grounds to host "home" matches. In the end, Asghar Afghan's team departed on a high note as spin-bowling talent Rashid sent down a brilliant final over to help pull off the 36th tie in one-day cricket history. "When you tie with a team like India, it's like winning," skipper Afghan said after his side bowled India out with one ball to spare. Shahzad was adjudged man of the match for his belligerent 124, which powered Afghanistan to 8-252. Opener Lokesh Rahul, who top-scored for India with a fluent 60 in his first match of the tournament, was not surprised by the growth he had observed in a side that became the 12th Test-playing nation in June. "We've seen how much they improved as a team in the last couple of years," he said. "Overall as a team, they cannot be seen as walkover. They're very competitive as a one-day and T20 side. They keep proving it over and over again." Afghanistan beat Sri Lanka and Bangladesh in the group stage but departed from the Super Four segment without a win despite playing in three final-over thrillers.